Remember when you would wait until the last minute to do your science project? Book report? Plan your Halloween costume? Tell your parents that you were going somewhere? Or needed a ride? Had to take a snack to school? Buy a gift? Or card? We all did that as kids. And some of us still do it. Everything takes more time than we think it does. 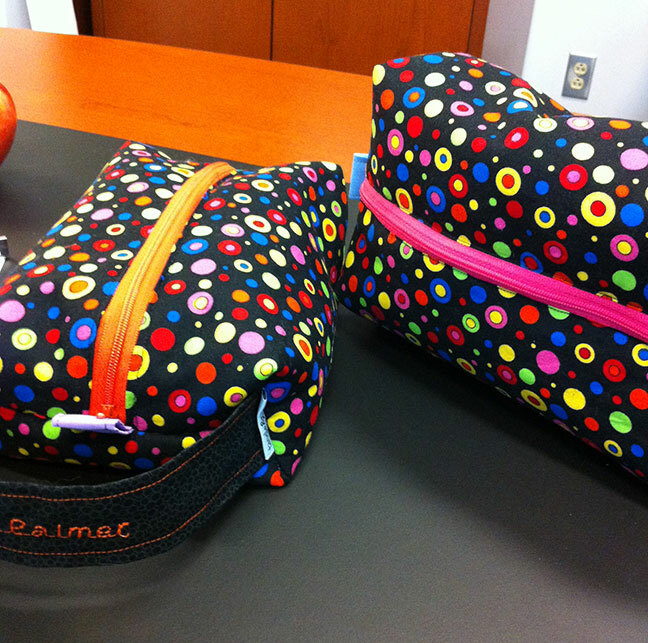 At the beginning of the school year my daughter said she wanted me to make box bags for the twins Pre-K teachers. As a Christmas gift? No. As an end-of-the-school-year gift? No. I was at my daughter’s house last week helping her build something. I’ll post pictures once it’s finished. Anyway, while she was cutting the plywood, I asked her again about the box bags and when the end of school was and what colors/fabric did she want me to make box bags. I didn’t know if these were to be for personal use and filled with personal goodies or for school use filled with school related goodies. It makes a difference when choosing the fabric. The bags were for school related goodies and she wanted them for Teacher Appreciation Day. Which was yesterday. The fabric was purchased Friday and washed that evening. I was too tired to think about cutting and sewing. Saturday was spent cleaning out the garage but I managed to get all the pieces of fabric and fusible fleece cut. I dug out the directions on Sunday and made one bag. Monday evening I had a hair appointment which involved color so I didn’t have time to finish the second bag until last evening. 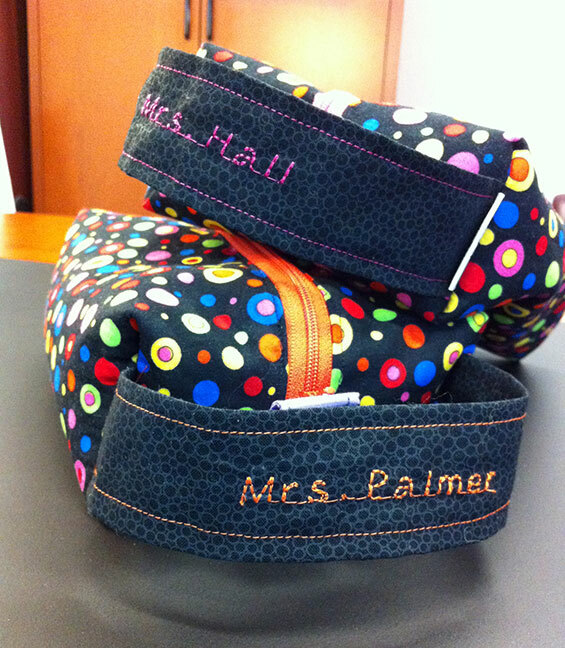 The teacher’s names were machine embroidered on the strap. 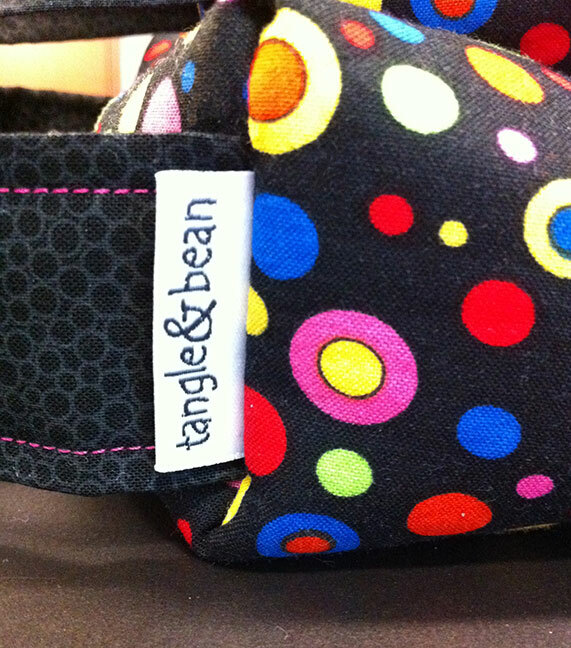 And my daughter’s tag was sewn in the seam. I like them. I just hate waiting until the last minute to make something as there is always a glitch. Like sewing the strap in upside down and having to redo it. But they are finished and on the way to my daughter to fill with goodies. I hope the teachers like them and use them. Do you still wait until the last minute to do something? Do your kids? 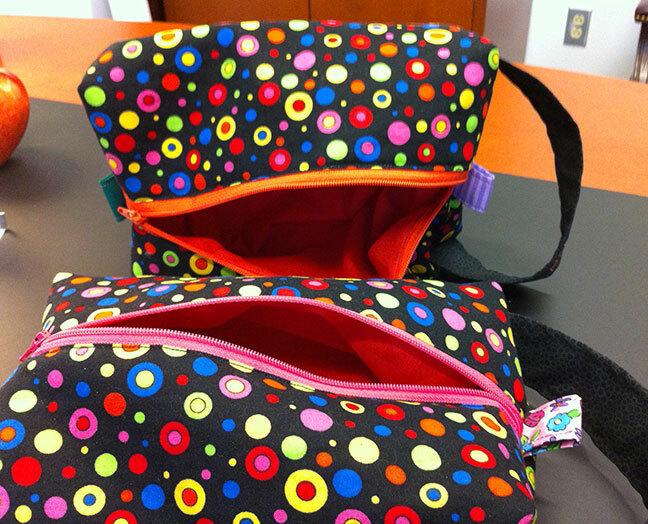 This entry was posted in sewing and tagged Box bags, gift, sewing, teacher appreciation by Patti_is_knittinginflashes. Bookmark the permalink. I would certainly enjoy a present like this.